I made it just in time! It’s the last day of November and I finally got around to sharing the Ipsy glam bag I received. This is the first bag I received after signing up for it last month. I received a total of 5 products in addition to the cosmetic bag and post card. One of the few items I tried so far is the eyeshadow pencil. Since it’s made of mineral oil and powder, it glides very smoothly on the skin and I love using this color under the eyes. The color is also pretty perfect for the holidays when used as a shadow. I’ve gotten a lot cosmetics over the past two months and so I didn’t get a lot of chances to try everything yet. But this mascara was a must try. I’ve read a lot of great reviews on it and I could definitely tell why. I think it definitely makes my Asian lashes look fuller, and darker. The other item in the bag is a serum; I haven’t tried this yet but it claims to be a “perfect fix for gloomy skin day” and hence the name. It’s a serum meant to soothe and moisturize irritated skin. The selling point for me is moisturize so I’ll give this a try in a few days. 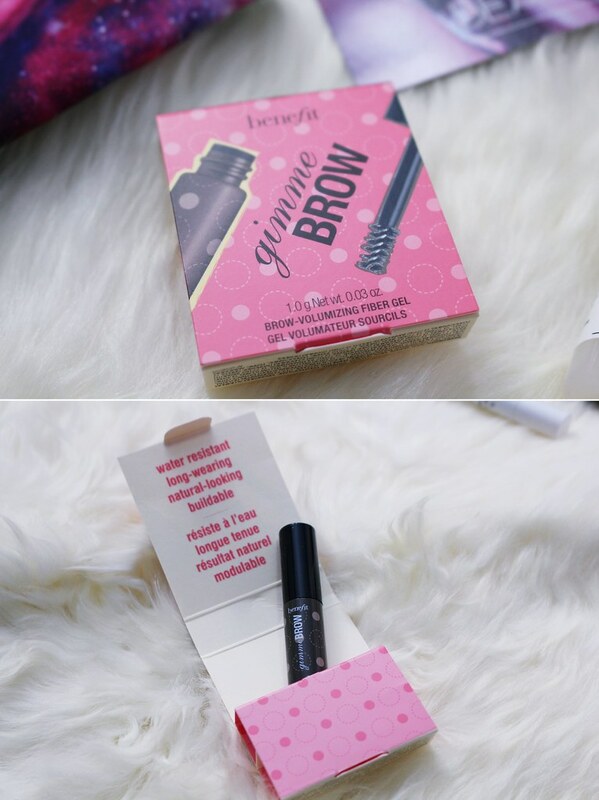 One of the items I really want to try is this brow gel. After I colored my hair, brow gels are a must. I’m not sure if the color will be right but I’ll be trying this soon. 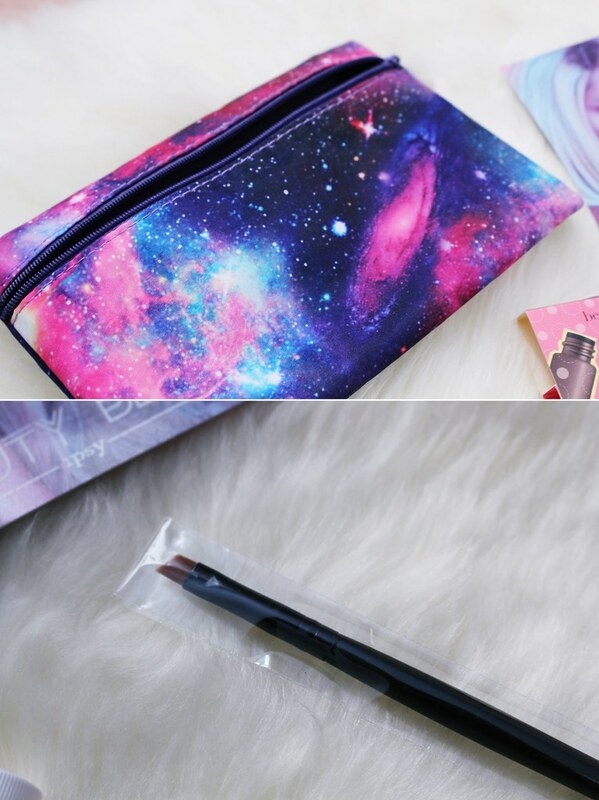 In addition to the galaxy themed cosmetic bag, I received an angle liner brush. This will be very useful for me since I mainly use angle brushes for lining my eyes. I was actually pretty surprised that there’s a brush in the bag and it seems to be a pretty good quality brush too. This is the first time I’ve signed up for these types of subscription bags/boxes so I’m pretty excited to receive the next bag; I’ll try to share it earlier in the month when I receive the next one. Can’t wait for more cosmetics haha. Have you ever signed up for a similar subscription? I didn’t get the Gimme Brow in my November bag, but I do use it occasionally. It’s a great product. Hopefully you’ll like it as well. I use Benefit Gimme Brow every day – it’s great. Hope you liked it. great box contents! 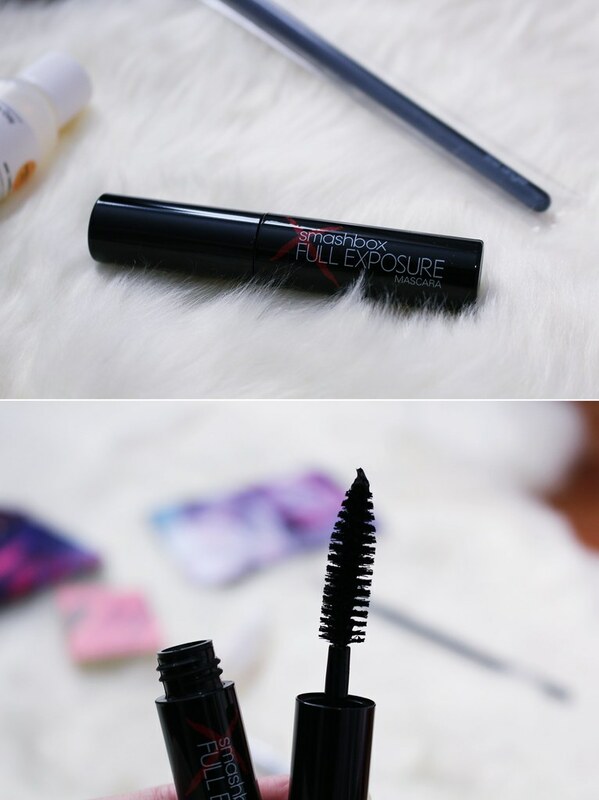 that mascara I want to try also! Oh boy, I’d love to get my hands on this box! The eyeshadow pencil is beautiful, and I’ve always wanted to try Gimme brow. 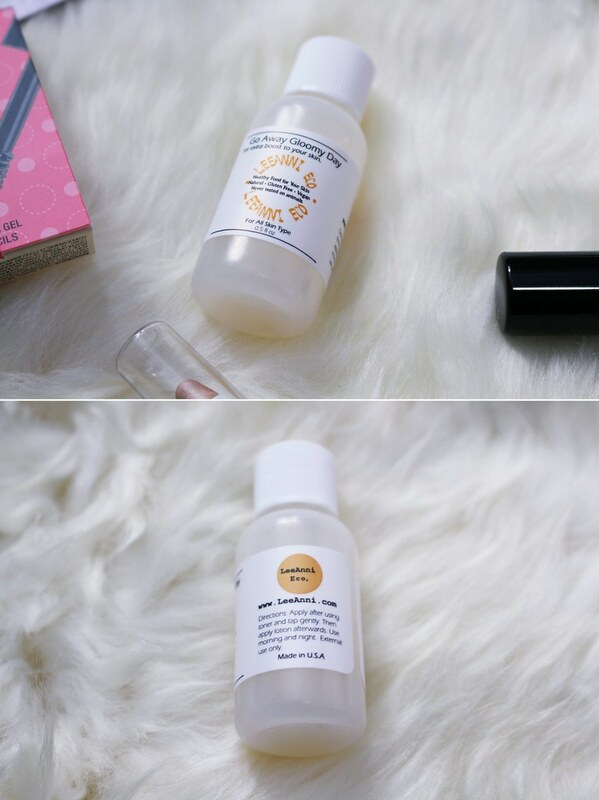 I’m using a super cheap tinted gel from Essence which looks just like the Benefit one, and it gets the job done. But the desire of trying the original Gimme brow is still alive haha! Cute cosmetic bag and pretty good samples too!